Mysore today,is a pleasant city with a old world charm,contributed by its broad shady avenues,well laid out gardens,fine buildings and a salubrious climate.Mysore city is 140kms away from Bangalore is a city of palaces,gardens,shady avenues and sacred temples and retains some of the charm of the old world with its many institutions that propagate Carnatic Classical music and dance. Mysore district is a popular tourist destinations, offering several attractions ranging from the royal splendour of Mysore city and its fabulous Dussehra festival to exquisite temples, pilgrimage centres and scenic spots. Situated in the southern part of the Deccan Plateau,Mysore district is an undulating tableland, covered in parts by granite outcrops and fringed by verdant forests.Mysore is located in the South Indian state of Karnataka around 140 km from Bangalore. The city extends from latitude 12°18' in the North to longitude 76°42' in the East. Mysore was the political capital of the Wodeyar dynasty, which ruled the state of Karnataka for some 150 years till the independence of the country from the British. These Kings were great patrons of art and culture and Mysore was the cultural capital of south under the rule of the Wodeyars.The Wodeyars made the dussehra festival an event to showcause the rich culture and heritage of the town. celebrated for 10 days from September end to early October which is the celebration of triumph of good over evil. Huge effigies Ravana, his brother and son are burnt. On the last day, with the accompaniment of a band, colorfully bedecked elephants carrying the statue of the goddess starts from the palace as a procession followed by palace chariots and units of the army through the city to Banni Mantap (where Banni tree is worshipped), about five kilometres away. The annual Vairamudi festival at the Cheluvanarayana temple of Melkote is a part of the Brahmotsavam during the month of Panguni (March-April). Vairamudi festival is celebrated on the 4th day of Brahmotsavam. On this day Lord Cheluvarayaswamy decked with the legendary diamond-studded crown (Vairamudi crown), along with his consorts was taken in a procession at the auspicious hour around the town. This nightlong even is witnessed by thousands of devotees. This is a very important festival of Karnataka for it is the Kannad New Year. The celebrity of this festival is Lord Brahma where the people begin the day with a ritual bath early in the morning, and comes to an end with prayers that continue late into the night. It falls either in the month of March or April. A 13kms motorable road or 1000 steps built by the Woodeyars can reach a prominent landmark located at the outskirts of the city, Chamundi hills. At the crest of this hill is the Chamundeshwari temple. The striking gopura was added by Maharaja Krishnaraja WodeyarIII in 1825.Near the temple is the statue of Mahisasura, the slayed by the goddess Chamundeshwari.Half way up the stone steps is the 4.8 metre high monolith of Nandhi, Lord Shiva's mount. This is a beautiful gothic structure with twin spires which is modeled on the gothic cathedral at Cologne. The Keshava temple located 42kms away from Mysore was built in 1268 as part of agrahara founded by Hoysala General Somanatha Dandanayaka.The temple is famous for its elaborate detail and for the fact that unlike the Hoysala temples in Belurand Halebid,it was actually completed. 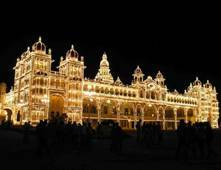 Designed by the English architect, Henry Irwin, the Mysore Palace dominates the skyline of Mysore.The palace is illuminated on Sundays, public holidays as well as during dussehra celebrations when 97,000 electric bulbs are used to illuminate it. The palace presents a profusion of frescoes, floor mosaic, wood carvings, solid silver portals, ornate domes, arches, colannades and sculptures. One of Mysore's most beautiful buildings, the Jagmohan palace was built in 1861 by Maharaja Krishnaraja Wodeyar in predominantly Hindu style as an alternative retreat for the royal family. Sri Jayachamarajendra zoological gardens, popularly known as the Mysore Zoo was established in 1892 under the reign of Chamrajendra Wodeyar. 19 kms north of Mysore is the famous reservoir Krishnarajasagarai.This dam is built across the river Cauvery.Just below the dam the beautiful Brindavan gardens are laid out. 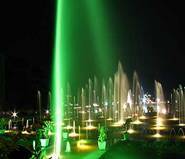 There is variety of fountains, illuminated at night by colourful lights. The musical fountain is of special interest which has spectacular harmony of water, colours and music. This is 18kms,from Mysore and it houses exotic birds. It is group of small islands in the Cauvery River. It is a home to a variety of waterbirds including comorants, herons, egrets and spoonbills, may of whom migrate here annually from Siberia and North America, to nest and breed. Srirangapatnam which is at a distance of about 16kms away from Mysore is noted for its fort,Ranganatha temple,dungeons and museum,Tipu Sultans summer retreat Daria Dulat and his mausoleum, the Gumbaz. Nestled between Indragiri and Chandragiri is this famous Jain centre of pilgrimage. A colossal monolithic statue of Gommanteshwara showing his legs entwined with creepers, stands here majestically atop Indragiri hills. Situated at the base of Chamundi Hills, first of its kind Family Entertainment Center in Mysore. Spread over 4 acres it houses 6 lane bowling alley, go-karting track, state of art video games, snooker, billiards, a multi-cusine restaurant and a cocktail lounge. Shopping in Mysore is a benefit bestowed for the shopping freaks and the tourists.Mysore is very famous for its silk, especially the sarees throughout the world. They are produced both by private weavers and Government Silk Weaving Factory in Mysore.One can shop these silk varities produced exclusively by the Government Silk Weaving Factory on Manandavadi Road and also in the shopping area around KR Circle in Mysore.The other things in the itinery to be shopped includes Agarbathies or Incense sticks. Mysore is also known for its handicrafts especially variety of wood. Beautiful woodcarvings, Bidriware, Metalware, Stone Carvings and Mysore paintings may lead you to a shopping with a lively outlet. For handicrafts one can visit numerous exclusive private shops dot around the Devaraja Market that skirts the main Sayyaji Rao road.The best place to buy these things is the Cauvery Handicrafts Emporium of the Karnataka Handicrafts Development Corporation. Mysore is very much known for its spicy and hot food,like huli or the sweet sambar,the bisebelle baath,Mysore Pak and the wafer thin dosas.Being a place visited by a number of tourists daily Mysore is specialized in all kinds of food. If you wish for a Continental breakfast then the best place is Shilpashri Restaurant & Bar at Gandhi Square. For sweets the best place is Bombay Tiffanys.Gopika Restaurant and Om Shanthi are the local favourites for vegetarian delicacies. For Kerala fish curry, walk into Dynasty on Sri Harsha Road. The nearest airport from Mysore is 140 km away in Bangalore, from where one can take flights for most of the important cities in India. Mysore is connected with a number of trains to Bangalore. The super fast luxury train the Shatabdi Express connects Mysore to Madras. 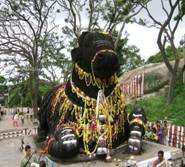 The quickest and most comfortable way to reach Mysore is via Bangalore. A convenient network of roads connects Mysore with the rest of the state. Located on the National Highway, tourists can reach Mysore by taking local buses from Bangalore as well. It takes around 3 hours on a bus ride from Bangalore to Mysore.